The annual report must have been published in the previous calendar year, and can’t be self-promotional. Normally this would mean the report pertains to the financial year before. If not, please make a note of it on the application form. as JPG (3600 x 1536 pixels, RGB, 72 dpi). Please send one sample of the annual report. Mark it discreetly with your submission code. 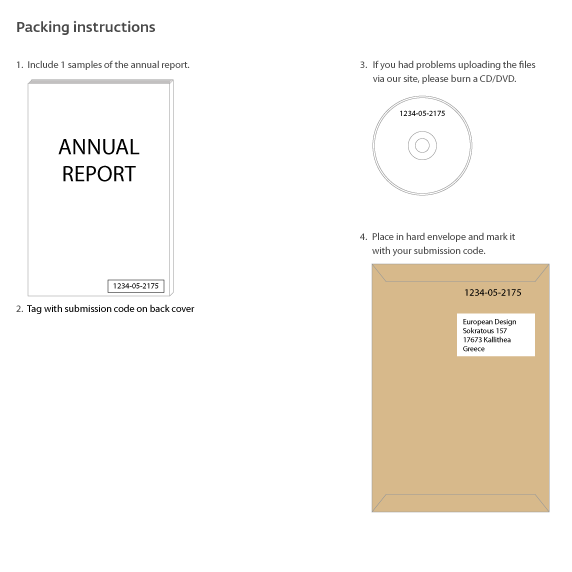 Place the annual report in an envelope and post it to European Design’s Greek office (to arrive no later than March 8).